Today's IMHO: We all use laundry detergent and usually buy those big side laying with spout containers. What you might not know is just how full you are supposed to fill that handy little cup that comes with it. The detergent manufacturers have a grand scheme going here that inadvertently causes consumers to use more detergent than is needed and thus replace it more frequently. THE BACKGROUND: The first thing you need to know is if your washing machine is high efficiency (HE) or not. If it is you will see this symbol in the manual. Going forward you will want use a HE detergent and if it was recently purchased Energy Star appliance (I think within a year for most situations) you can apply for special rebates from your utility company. 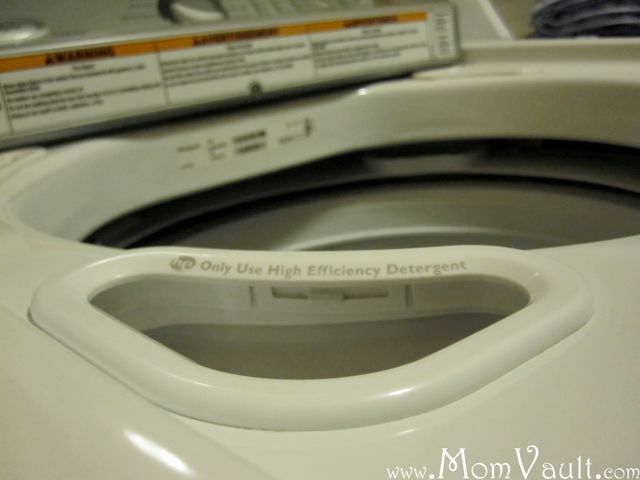 The reason you need HE detergent with a HE washer is because the formula is concentrated (so less watered down) and also does not cause as many suds as regular detergent. Too many suds during any of the cycles in a HE washer could cause problems and result in poorly cleaned/rinsed clothes. In the past I had always just filled up the cup because I figured it came with it and I must need to fill it for each load...WRONG. Unfortunately, this is a common misconception, a gross overuse of detergent, and it doesn't make your clothes cleaner. It can actually lead to advanced decay and the mildewing of your clothes and also promotes bacteria growth and odor in your washing machine if it's not fully rinsed out. I have three different detergents in my home right now and all three of them have fill caps that don't clearly illustrate the correct fill lines. They just have lines around the cup that look like decoration or some necessary design to keep the cap snapped onto the spout after use. Which brings me to my next point... who actually puts the cap back over the spout? It was one thing when I had a regular washer without a locking lid and I could rinse the detergent cup in the running water of the washer, but now my HE washer locks before any water comes out so I'm left with a cup dripping with traces of detergent. I stopped using the cup altogether and just pour it straight from the ventilation cap. IN MY HUMBLE OPINION: Detergent containers need to be reinvented with an economical and logical way to use the correct amount of detergent.